The response to possible bank card fraud is one of the most important factors affecting the relationship that customers have with their bank. For customer-centric financial institutions who issue millions of bank cards, any instance of possible fraud is both a business risk to be managed and an opportunity to strengthen customer relationships. To help identify these financial risks the bank uses a third party fraud detection system that issues real-time alerts on unusual card activity. In the past, these alerts were sent directly to the bank's highly trained Bank Card Security specialists who would manually call customers and work with them to verify and resolve the suspicious card activity. They would then update the CRM system so the interaction was included in the customer record. 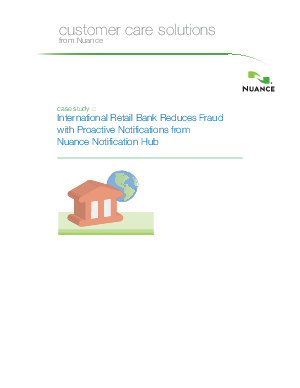 Although customers appreciated the proactive approach and the bank reduced losses due to fraud, the specialists were spending unnecessary time dialing and trying to reach customers rather than working to reduce fraud.